Sovtransavto Germany GmbH is an international freight forwarder. Russia transports are the main focus in our service portfolio as well as transport in the CIS countries, Eastern Europe, the Baltic States, the EU, the Caucasus region and Central Asia. 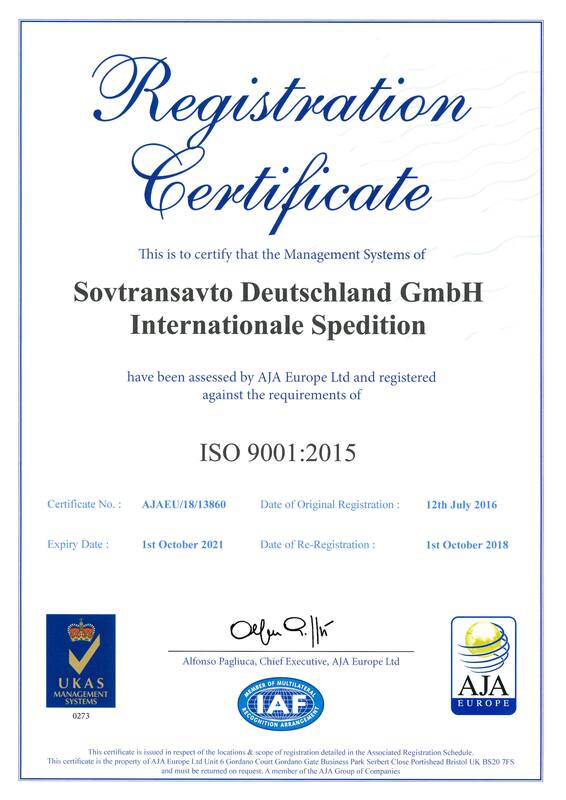 Sovtransavto Germany GmbH Internationale Spedition was founded in 1991 as a subsidiary of the Russian holding company ZAO Sovtransavto, Moscow. For almost 25 years we offer our customers transport, customs, warehousing solutions and are a reliable partner for your business. At our head office in Cologne and branch offices in Aschaffenburg, Kiel, Fürstenwalde / Spree we offer you an optimal service in all forwarding and transport sectors subsidiaries and joint ventures in Russia and Poland complement our services. We realize both individual stages of the supply chain as well as complete door-to-door solutions including transport documents clearing, customs clearance and insurance and, if necessary, the entire foreign trade outsourcing including the development of supply contracts and negotiations with foreign suppliers. You can count on the vast experience and expertise of our forwarding. Our close contacts with carriers and all relevant transporters allow us to operate all transports quickly, reliably and without complications.